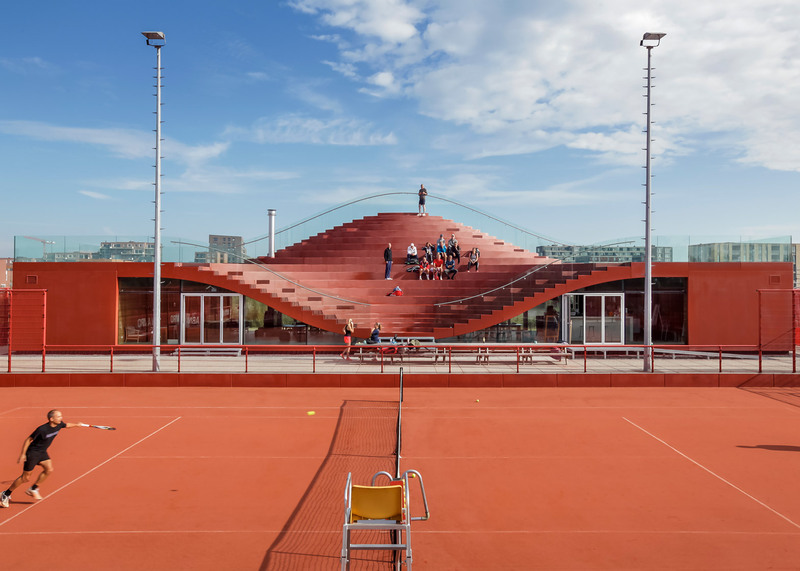 The roof of this bright red tennis clubhouse by Rotterdam firm MVRDV doubles up as an expansive seating area for game spectators (+ slideshow). 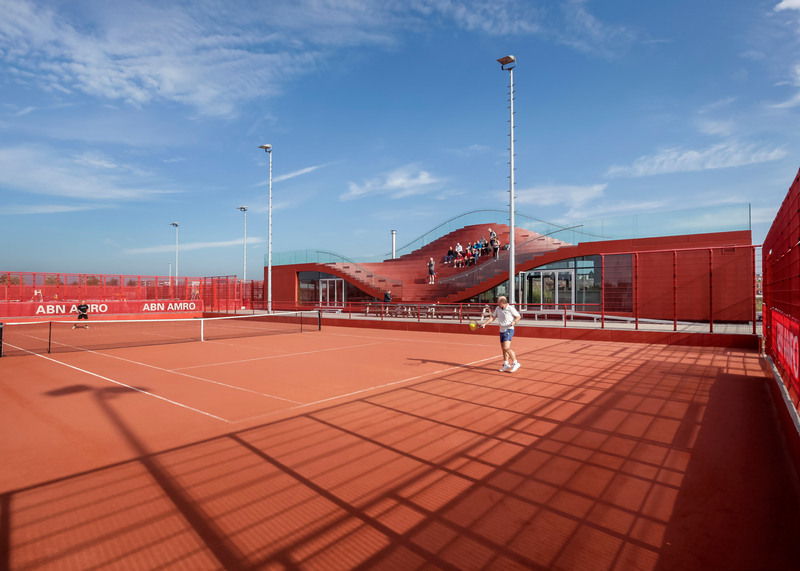 Located in east Amsterdam on one the artificial islands that make up the city's IJburg neighbourhood, the building provides a new facility for a tennis club established in 2008, which already has 10 clay courts and a tennis school. Rather than developing a simple rectilinear structure, MVRDV felt the building could also integrate bleacher-style seating, encouraging visitors to clamber up onto the roof and watch the games talking place alongside. To allow this, the curved roof is raised up on the rear north side, but dips all the way down to ground level at the south-facing front. This creates a bowl-like seating area with steps spanning its entire width. It also inspired the name, The Couch. 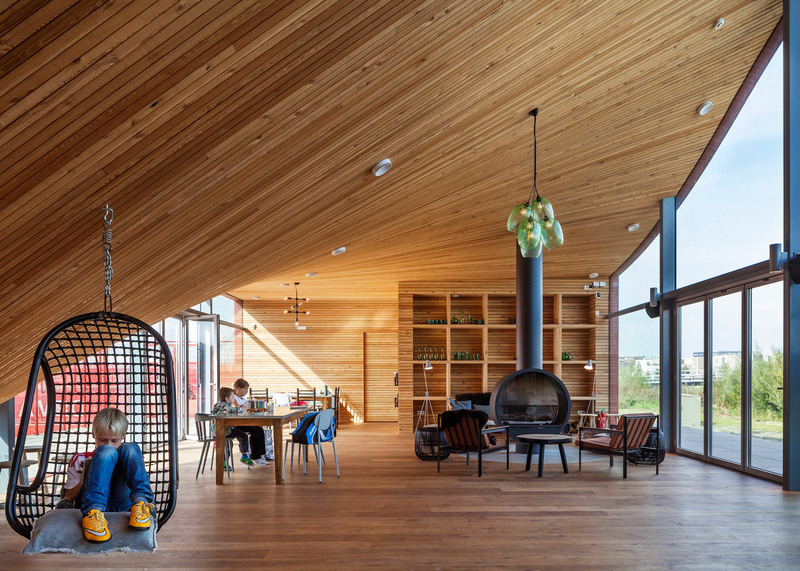 MVRDV – whose past projects include a horseshoe-shaped market hall and a commercial building disguised as a farmhouse – describes this rooftop as "an informal tribune". It can seat up to 200 people. 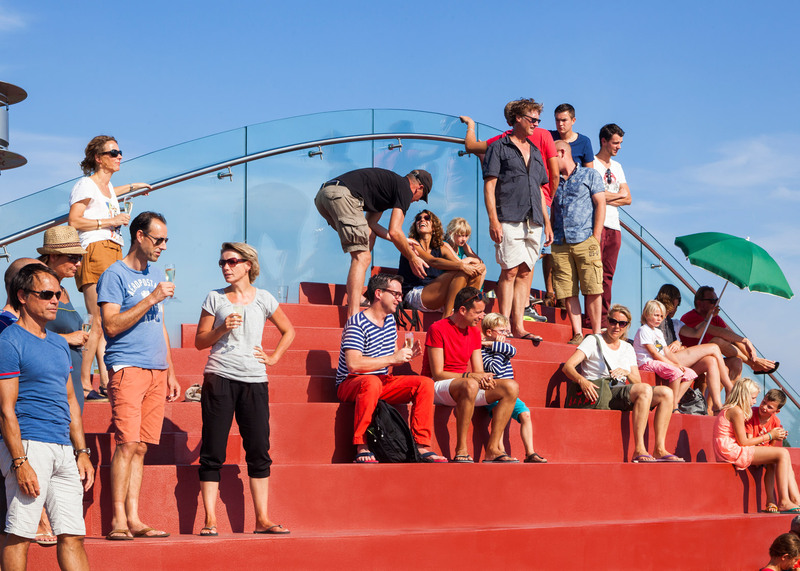 "With the Couch, we have integrated sport into society," said MVRDV co-founder and architect Winy Maas. 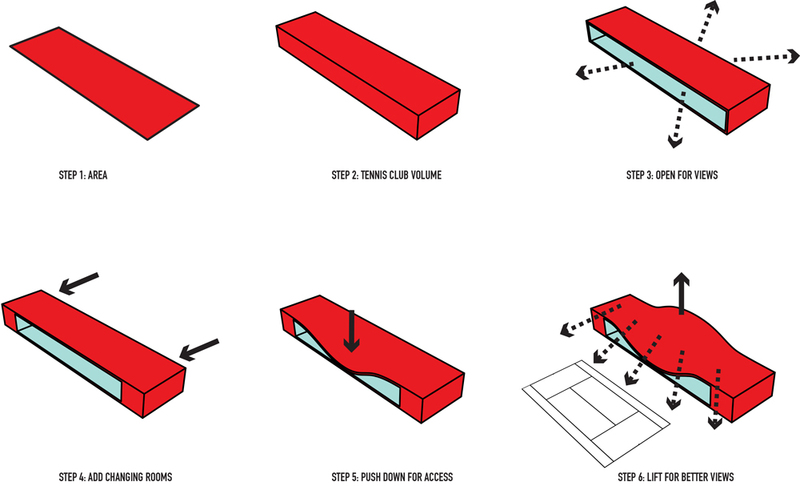 "By turning the roof of the club-house into a tribune, a Centre Court is created." "Here we celebrate the talent of the amateur players who are challenged to excel in front of the public." IJburg consists of six islands artificially raised from the IJ Lake, and more are due to be created in the future. Many new buildings have been completed in the area over the last few years, including a house with a glass facade and an all-timber residence. MVRDV first unveiled its design for The Couch in 2013. The building measures 36 metres in length. The ends of the structure house utility areas, including changing rooms and kitchen facilities, freeing up the central space for various events. Glazing is concentrated along the long front and rear walls, bringing in plenty of natural light and allowing views right through the building. The building's bright red colour comes from a polymer spray coating that covers its cast-concrete structure. 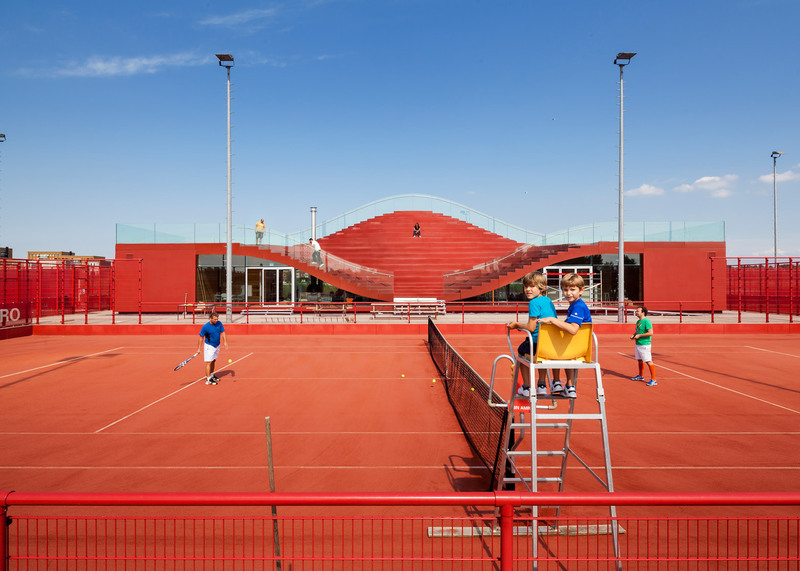 This allows it to match the red clay of the tennis courts. "By covering the entire building in red polyurethane the club gains visibility: an advert for sports and movement," added Maas. 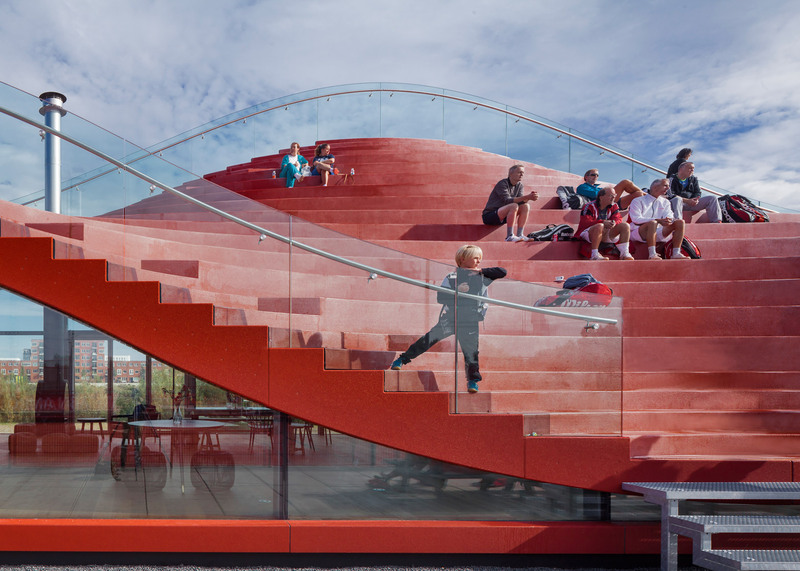 "The essence of the building is the stimulation of fitness and the fight against obesity and inactivity." Inside, the underside of the roof, the floor and the end walls are covered with timber. 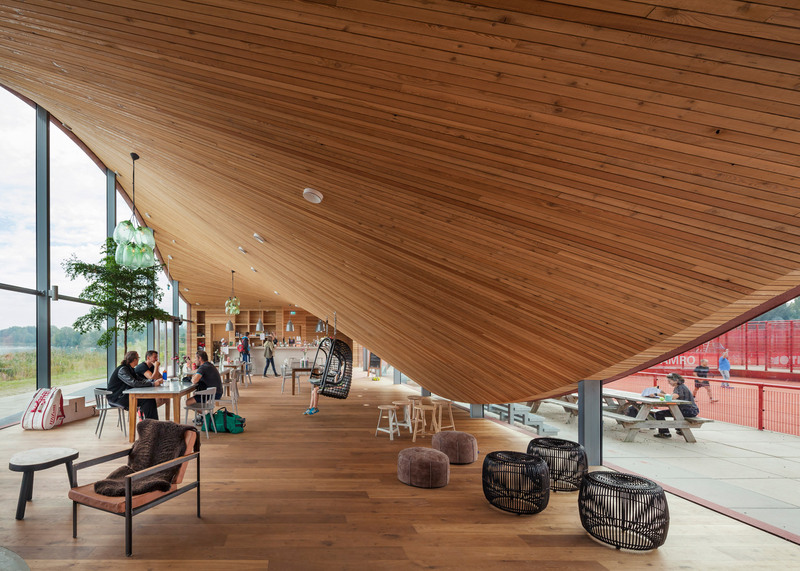 The project was completed in partnership with local firm Studio Bouwkunde. It is MVRDV's eighth project to be built in Amsterdam, with others including the polychromatic Silodam apartment building and the Parkrand housing development.